For lots of different reasons a soccer club can seek refuge outside their own country. In this article Vancouver Whitecaps was in a way an American franchise in Canada, while the sporting life in Northern –Ireland was made impossible for Derry City. And Perth Kangaroos were disregarded in Australia and set their eyes on Singapore, while the Singaporean youth team LionsXII took up an invitation from Malaysia. In 1979 the North American Soccer League (NASL) was packed with big soccer stars, although most of them were past their prime. For this season Franz Beckenbauer, George Best and Carlos Alberto got company from stars like Johan Cruyff, Johan Neeskens, Gerd Müller, Francisco Marinho, Björn Nordquist and Teofilo Cubillas. North of the border in Vancouver, the big names were not that big. 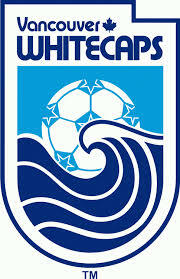 The Whitecaps had a mixture of Canadian and English players, with good old Alan Ball (world champion in 1966), Trevor Whymark and Kevin Hector as their main assets. Behind regular goalkeeper Phil Parkes, a unknown Bruce Grobbelaar just managed to play in one match. During the season Vancouver first won the Western Division of the National Conference ahead of Los Angeles Aztecs, and easily qualified for the play-offs. In which they first beat Dallas Tornados 3-2 and 1-0. After that, they needed a mini-game (30 minutes of extra play, starting with 0-0) and a Kevin Hector-goal to beat the Los Angeles Aztecs in the quarterfinals. Then they clashed with big favorite New York Cosmos in a nerve wracking semi-final. Both teams won their home-match: Vancouver 2-0, goals by Trevor Whymark, and Willy Johnston. Cosmos won 3-2, with Cosmos-goals from Giorgio Chinaglia (2), and Vancouver-goals from John Craven and again Johnston bringing it to another shoot-out, which Cosmos won. So another mini-game was needed, and after that another shoot-out. At the end, Cosmos-player Nelsi Morais was beaten by the clock – it took him longer than five seconds to score – and Vancouver were in the final, in New York. 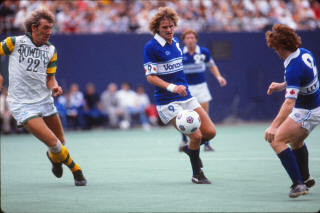 Trevor Whymark scored both goals in a 2-1 win against Tampa Bay Rowdies. 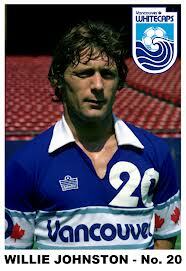 This made Vancouver Whitecaps the only Canadian team ever to win the NASL. 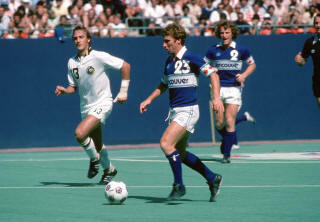 Alan Ball was voted the play-offs MVP, Phil Parkes was best goalkeeper of the year and the only Whitecap selected for the All Star Team – with New York Cosmos providing no less than five players. Vancouver didn’t mind, as more than 150,000 fans – the largest public demonstration in Vancouver history – gave the team a warm welcome as they arrived back home from the USA. Derry City were a big (catholic) club in Northern Ireland, especially back in the fifties and sixties, winning the league in 1964-65. In 1972, with tension rising between catholics and protestants, some clubs refused to play in (London)derry and as a result Derry City was expelled from the league. Thirteen years later, the club was elected to the newly formed second division in the Irish Republic. 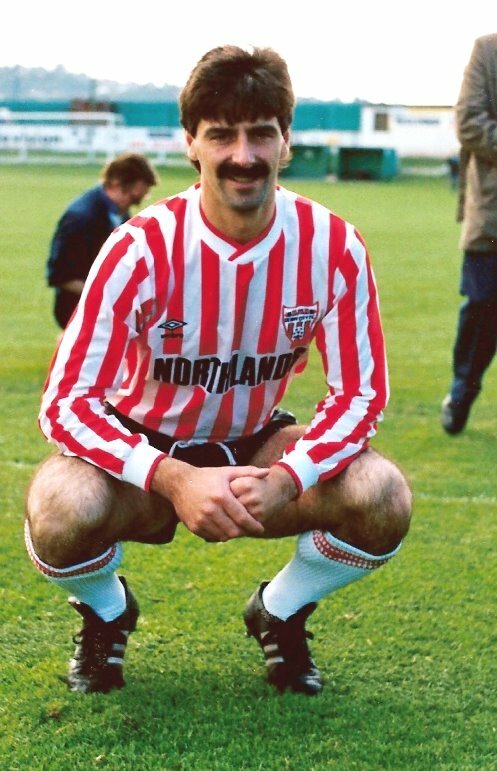 With the help of league top goalscorer (18 goals) Yugoslav Alex Krstic, South African Owen Da Gama (10 goals) and 35-year old Alan Sunderland (ex-Arsenal), Derry City won promotion to the First Division in 1987. Two years later they were crowned champions of the Republic of Ireland. The players mentioned above were all gone, Derry City had a young team with mostly 22, 23-year old players. They also had money to spent, and they made an excellent choice in the summer of 1988 with the Shamrock Rovers-duo Paul Doolin and Mick Neville. The all-important match was a 2-0 victory over biggest rival Dundalk (goals by Liam Coyle and Jonathan Speak). Coyle was perhaps the most talented Derry-player, who was still among the Derry City ranks fifteen years later. Together with Paul Curran and Paul Hegarty from the 1989 team, Coyle won a second championship with Derry in 1997. Club topscorer of the 1988-89 season was Jonathan (Johnny) Speak, who scored 12 league-goals, only half of his total from the season before. Experience that year came from two oldies, Noel Larkin and Felix Healy. Both 34 years old and big names in the Republic (Larkin) and Northern Ireland (Healy). 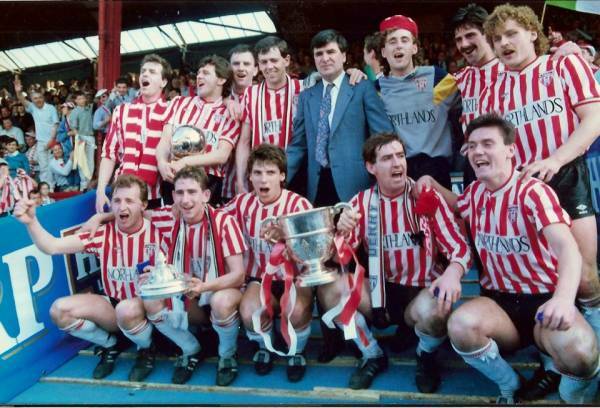 Derry did not only win the league that season, they also won the League of Ireland Cup (4-0 against Dundalk) and the F.A.I. Cup. In the final they beat Cork City 1-0 (goal scored by Healy) in what was Noel Larkins last match before immigrating to Australia. Soccer in the Australia Soccer League (starting in 1977) was dominated by clubs from Sydney and Melbourne. Perth, situated on the other side of Australia (the west coast), was denied access to the league for several years. While looking at the enormous distance between Perth and those two cities, that seems nearly logical. From a sporting viewpoint, it was a pity. Disappointed people in West Australia sought first class soccer elsewhere, and found it in Singapore. After some hassle about finding enough players for the team that was called Perth Kangaroos, they entered the league. From the city of Darwin, another Australian club, Darwin Cubs, did the same. It soon became clear that Perth Kangaroos was in a league of their own in Singapore. Not surprisingly, as the best clubs and players in Singapore were competing in the Malaysian league. Perth Kangaroos won their first sixteen matches in a row and were already champions when Singapore Air Force SA managed a 1-1 draw. Exactly two months earlier the Air Force team had suffered a humiliating 10-1 defeat against the Australians. For Jurong FC it got even worse, losing 11-0. In all, Perth Kangaroos scored 75 goals in 18 matches, with Paul Strudwick (16) and Gary Lees (15) topping the scoring charts. Gareth Naven was voted best player. Financially this adventure was a catastrophy for the club. As Perth Kangaroos was winning the league effortlessly, attendances experienced a dramatic drop. And although the club signed a three year contract, the Kangaroos withdrew from the league after one year. Darwin Cub, who finished second in 1994, stayed for another season, but eventually quit the league before the end of that 1995 season. Perth finally made its debut in the Australian Soccer league in 1997, as Perth Glory. 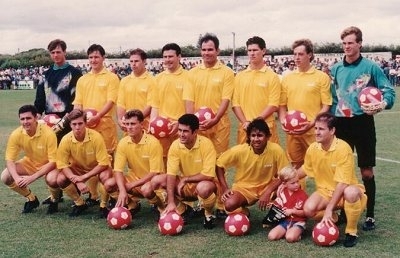 Quite a few players (Vladimir Beretovac, Vince Matassa, McVittie, Gareth Naven and his twin brother Craig, Strudwick, Dale Wingell) from this Asian enterprise continued to play for Glory, with Scott Miller even earning two caps for Australia. Perth Glory became Australian champions in 2003 and 2004. While Singapore FA won the Malaysian league back in 1985 and 1994, it was not a regular club team. The league at that time consisted only of representative teams from regional football associations. So I skipped that, although certainly the team in 1994 (with star strikers Abbas Saad and Singapore’s best ever player Fandi Ahmed) was legendary. It is only since 2002 that clubs from Singapore play in the Malaysian league, but didn't win it, until one month ago this season. In their second year LionsXII finished on top, just ahead of Selangor. To be precise, LionsXII also isn’t a real club team, but it is presented as such. In fact, its the Singaporean national Under-23 selection. 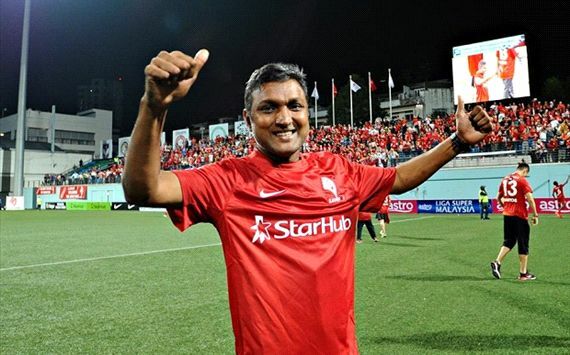 The main goal for LionsXII this season was finishing in the top five, and preparing for the 2013 Southeast Asian Games. They were allowed to include four overage players, to give this Under-23 team some experience on the field. Three of them, Shahril Ishak, Isa Halim and Baihakki Khaizan did a tremendous job. 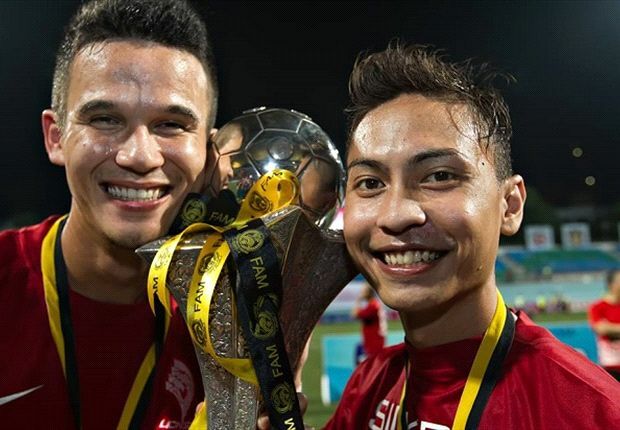 Especially 29-year old captain Shahril Ishak was great. His skills are wellknown in this part of Asia, as he was voted ASEAN Footballer of the Year in 2012. Furthermore, the team was tactically very strong and had a great defense, led by goalkeeper Izwan Mahmud, Safuwan Bahruddin and towering defender Baihakki Khaizan, conceiding only fifteen goals. Upfront, Shahril Ishak (8), Shaifq Ghani (5) and Baihakki Khaizan (5) also did quite well. But they were no match for league top goalscorer, Marlon James from St. Vincent, who scored 16 for his team ATM. While other teams spent lots of money on big stars who not always lived up to expectations, LionsXII’s coach V. Sundramoorthy concentrated on teambuilding. No one in his club got overpaid. Of course the famous Singapore striker from the nineties was voted Coach of the Year for his attribution.